Email Maniacs provides email service for the HaleOnoLoa.com domain. The @HaleOnoLoa.com email address includes a 5GB IMAP mailbox with NO advertising. To get a @HaleOnoLoa.com email address, please press "Get Email" below and choose HaleOnoLoa.com from the pull down menu of domains. NOTE: @HaleOnoLoa.com email addresses are available on a first come, first served basis. 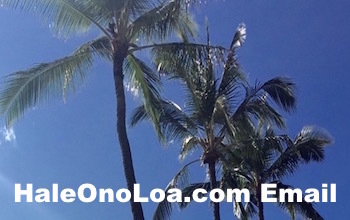 Do you currently have a @HaleOnoLoa.com email address? If so, go here for setup instructions. Go here to learn more about Hale Ono Loa.